Item # 310458 Stash Points: 1,595 (?) This is the number of points you get in The Zumiez Stash for purchasing this item. Stash points are redeemable for exclusive rewards only available to Zumiez Stash members. To redeem your points check out the rewards catalog on thestash.zumiez.com. 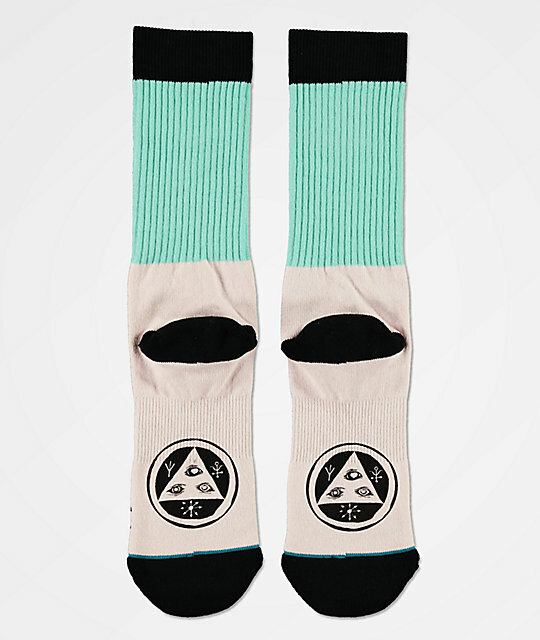 Watch yourself with the Owl Be Watching Pink & Mint Blue Crew Socks from Stance x Welcome. Featuring a large screen-printed owl graphic on the front shin and ankle, embroidered Welcome wordmark logo and hidden Talisman logo at the ball of the foot, these comfortable, combed cotton socks are more than meets the eye. Logo Black Crew Socks from Stance x Welcome. Collaborative design from Stance and Welcome. Jacquard Stance logo graphics at the ankles. Welcome Wordmark logos down the back. Machine wash cold, hang dry for prolonged use.